Click once on the images, then 1 second time to zoom. Superb oil on panel signed on the top left of the fougére dated 1917 size 46 cm x 58 cm in its beautiful old frame 62 cm x 76 cm. Thanks for adding me to your favorites list! Check out my other items! Portraits, seascapes, landscapes, still lifes ... The payment of your purchase must reach me imperatively within six days from the date of your acquisition. 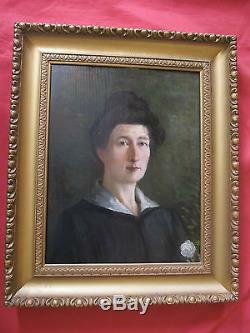 The item "superb oil portrait of woman from 1917 signed fouengre" is on sale since Wednesday, July 22, 2015. It is in the category "art, antiques \ art of the twentieth, contemporary \ paintings". The seller is "janys007" and is located in ambleny. This item can be delivered anywhere in the world.